Altrincham Football Club has a proud history, which includes knocking more League sides out of the FA Cup than any other curent non-league side. (For details see below). They have also been founder members of the Cheshire County, Northern Premier and the Alliance/Conference leagues as well as Conference (Nationwide) North. Nicknamed 'The Robins', Altrincham played 2004-05 season in the new Conference (Nationwide) North feeder division, which was created between the NPL and the Conference National division. They finished fifth and via the play-offs won back their National status with victory over Eastbourne Borough at Stoke City on 15 May 2005. Altrincham were ever-present in the National Conference from 1979 until 1997 and regained this status for 1999-2000. However, they were relegated once more to the UniBond in May 2000, albeit with the lowest number of defeats of any side ever demoted from the Conference and despite achieving the second-longest undefeated run of any side that season of 14 matches. The Club is running three sides in 2005-06. As well as the first team (Conference National) and the youth team (N.W. Youth Alliance League), a reserve team (Lancashire League) was re-formed for last season (04/05) after two years' absence. Click on the buttons, above left, for details of each team. On 14 October 2002, Graham Heathcote (left) replaced Bernard Taylor as manager. Graham has spent most of the last 33 years at Moss Lane as, firstly, a player and then as coach and was part of the famous Altrincham giant-killing FA Cup side which was a national force in non-league football in 1970s and 1980s. He first became Alty coach under John King but resigned, with King, in early 1998. Bernard Taylor then took over and won the UniBond Challenge Cup that season before, early in 1998-99 season, he appointed Graham as his coach. The two then took the club to the UniBond Championship in 1999 but, in December, Graham resigned following the appointment of Stan Allan as Director of Football. Lying 10th in March 2000, Altrincham were relegated from the Conference in May after a disastrous final 11 games, at which point Bernard Taylor resigned. 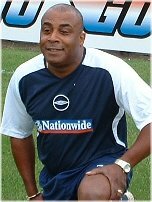 After Mark Ward's managership (2000-01), Graham was again appointed as coach to manager Bernard Taylor, in March 2001. In June 2002 Graham's coaching contract was not renewed by the then Board and Andy May took over as Bernard's new coach for 2002-03. Financial constraints led to a big cut in the playing budget and the side suffered a poor run of results from March 2002, winning only 7 competitive matches out of 35 until Bernard and Andy were dismissed in October 2002 and Graham took over as manager. Graham has also had brief spells in management elsewhere, notably at Barrow and Witton, as well as being John King's assistant at Runcorn. With a small budget and squad, Graham and Dalton Steele (see below) masterminded a return to the Conference National division for 2005/06, which must rank alongside the club's greatest achievements. Dalton Steele (right) is Altrincham's assistant manager. 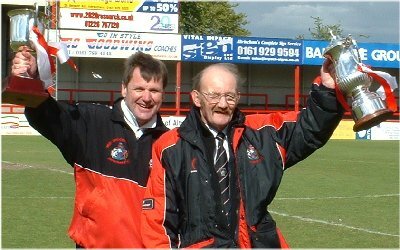 Dalton was originally appointed on 23/10/02 when he moved to Moss Lane from his job as the Flixton FC manager. He resigned on 29/11/03 but returned to the job in mid-May 2004. Dalton has extensive knowledge of local football having also previously managed Winsford United, Chorley and Droylsden. He is well used to operating on the sort of tight budget that now prevails at Moss Lane. Outside football, Dalton works as a Health and Safety expert. Neil Brown is manager of Altrincham Reserves. He has been coach and manager at successful local junior club, Fletcher Moss, for ten years. Neil is also a scout for Liverpool FC. He is assisted by Carlos Marsden and physiotherapist Alan Ainsley; kitman is Michael Brown. George Heslop is the Club's Youth Team manager, as well as its Matchday Secretary (see below). With coach Neil Thomason he guided the side to the NWYA league and cup double in 2000-01 and again in 2003-04. Above, George (right) and Neil (left) are seen with the 2004 trophies. Neil resigned in summer 2005 and very sadly died. For 2005-06 George is assisted by Tony Spilsbury, a former Altrincham reserves' manager. Sean Riley joined as the club physio in mid-October 2004, succeeding Gary Thompson who had moved on to Halifax Town at the start of the season. Sean was formerly the physio at Accrington Stanley and has also been resident physio for the Blackburn Sunday League and for Gt Harwood Town and Bamber Bridge. He was also involved in the GB team for the World Student games in Beijing and holds an FA diploma in the treatment and management of sports injuries. Former Chairman Gerry Berman remained the largest minority shareholder until he transferred his shares to the current Chairman, Geoff Goodwin, in April 2005. Other major shareholders for many years included Club President, Noel White and former manager John King as well as Graham Heathcote. However, in early 2005, White and King donated their shares to the Board. The Club's Associate Directors include Angus Loughran, 'Statto' of TV sports punditry fame. Despite revenue from a good FA Cup run in 2001, the Club is still in a financially difficult position with debts to pay off to the Inland Revenue and others. As a result, major economies now apply and a cut of 40% on the wage-bill was imposed for 2002-03 and retained in 2003-04. Despite numerous long-term injuries and player unavailability through work commitments, manager Graham Heathcote built a team for 2003-04 which was characterised by its team spirit and refusal to be beaten. For 2004-05 astute signings were made, notably Colin Little, Colin Potts, and Eddie Hussin, whilst the wily Val Owen joined during the season. Despite a string of injuries, the side performed well in Nationwide North and was in the top six for most of the campaign before clinching promotion in the play offs, after finishing fifth in the table. Alty also lifted the Cheshire Senior Cup in 2005 by beating Crewe Alexandra. Geoff Goodwin's Go Goodwins Coaches are the club's main sponsors. Carole Nash Insurance sponsor the main stand as well as having their logo on the team shorts and the shirt-backs. Bob Peters's company 20/20 Research were the Youth Team sponsors in 2004-05. For £500+VAT up to ten guests enjoy a pre-match hot buffet and complimentary drinks, as well as selecting the Man of the Match. To sponsor the match ball costs £100+VAT; the ball is presented before the match by a player selected by the sponsor. For full details ring the Club (0161-928-1045) or contact Barry Pond at the Club on matchdays. NB Prices subject to confirmation. If segregation is in force (a rare event), the home supporters' terracing is at the Golf Road end (the end nearer to Altrincham town centre); normally two of the four turnstiles are open into this end on match days. The Golf Road End was renamed the Debbie Dawson End for 2004-05 as a prize in the STAR raffle. Away supporters normally use the 20/20 (Hale) End of the ground, which is uncovered. As shown on the adjacent plan, the Carole Nash (Main) Stand and the Goodwin Family Stand (formerly the Blue Cannon Stand) are both on Moss Lane. The opposite side of the ground comprises terracing known as 'The Popular Side'. There is a licensed bar inside the ground which is open on match days before, during and after the match- this is known as the Noel White Suite. It is situated under the main stand at its Golf Road end. Also, at the Golf Road end, is the Robins' Shop (between the bar and Golf Road) as well as a mobile catering unit. For details of shop merchandise, click here. Another catering unit is situated at the Hale end of the ground and toilets are to be found adjacent to this, as well as at the Golf Road end and near the main stand. Why not hire a function room at Moss Lane? Details of this and sponsorship opportunities are here. Altrincham were founders of the Alliance Premier League (now the Nationwide Conference) in 1979/80 and were its winners in the first two seasons of the competition, at a time when automatic promotion to the Football League was not in place. They failed to gain election to the League by one vote in 1980- see here. In 1997 the Club suffered its first ever relegation and for two seasons were in the Unibond Premier League (Northern Premier League). These years are chronicled in detail in Grahame and Terry Rowley's Altrincham Football Club: the Unibond Years, published in 1999. The turbulent mid-1990s are covered in Mark Harris's informative Altrincham FC: Kingdom come, published in 1995. See the full Alty league record, 1907- here. 1979: Tottenham Hotspur 1 Altrincham 1 (3rd Round) - the replay, at Maine Road, Manchester, was lost 0-3 on 16 January. The Spurs side in these matches included Osvaldo Ardiles and Peter Taylor. 10,275 for Altrincham Boys v Sunderland Boys, 28 February 1925. The highest away score at Moss Lane was the 3-7 defeat by Slough Town in October 1991. Away from home, Alty have conceded seven on 27 occasions, the last being at Morecambe on 17.2.1996.